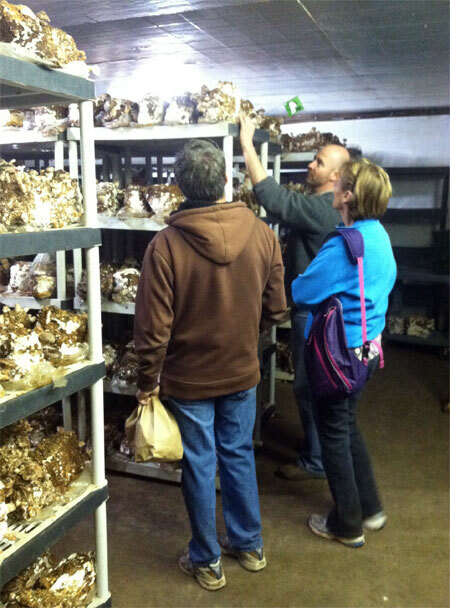 In preparation for our bed-raising project last weekend, my parents took a trip up to Hazel Dell Mushrooms in Fort Collins to procure some mushroom mulch along with a friend who swears by the stuff for her own gardens. Hazel Dell grows organic wild mushrooms on a mixture of steam-sterilized hardwood sawdust, wheat bran, rice bran, gypsum, and limestone, and you can pick up a truckload of the used substrate for $30 as a soil additive. I wish I could have come along to ask some questions about mushroom growing! My parents were able to take a little tour and purchase some mixed bags of fresh mushrooms while they were there, and they were kind enough to bring back a bag for me. I think this was about a pound of mixed wild mushrooms for $10, which amounted to something like three meals’ worth for us: mostly king oyster and shiitake, with a few cremini and lion’s mane. I want to highlight the lion’s mane mushrooms, and not just because they have such a unique look and flavor. 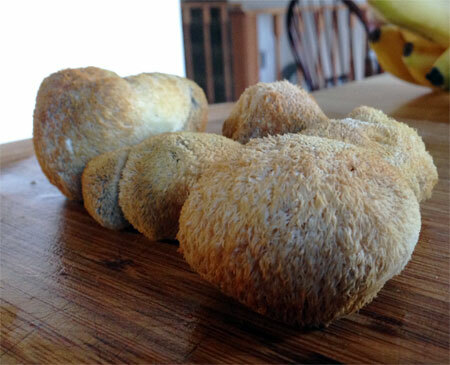 These mushrooms have actually been studied for their neuroprotective effects and ability to stimulate nerve growth factor–in other words, lion’s mane mushrooms can actually promote nerve regeneration, and may have tremendous therapeutic value for a whole range of neurodegenerative conditions, including Alzheimers, Parkinson’s, diabetic neuropathy, multiple sclerosis, and many others–perhaps even for autism! I cooked the mushrooms in several different ways throughout the week. 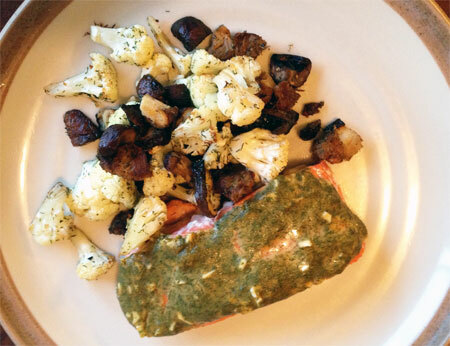 Here you can see dill-dijon baked salmon with a mixture of roasted cauliflower and mushrooms, based on this recipe. I very successfully mixed some of the leftovers into my breakfast egg scramble the next day also. 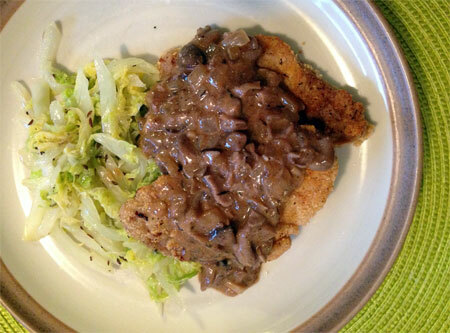 The big winner this week for showcasing wild mushrooms was this paleo jaegerschnitzel, which I served with melted caraway-scented Napa cabbage. The pork schnitzels were double-dipped for an extra-crispy coating that actually stayed on, contrary to most nut-crusted recipes I have tried in the past. I fried them up in a mixture of lard and bacon grease, and then held them in a warm oven while preparing the mushroom gravy and cabbage. I should also add that Theo adored this mushroom gravy and made a whole meal out of the leftovers–cooked mushrooms are a good finger food for older babies because they are soft and savory and full of nutrients like vitamin D, B complex, selenium, iron and zinc, as well as a decent source of non-animal protein and even some phytonutrient antioxidants. 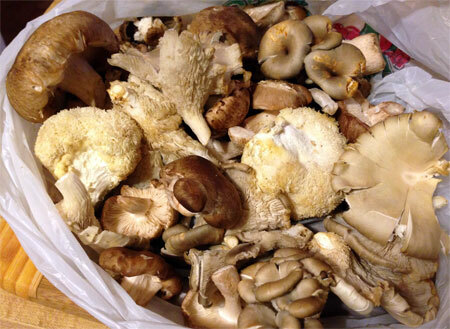 Additionally, many mushrooms are immune boosters among their other benefits. Like cacciatore, the name jaegerschnitzel refers to a cutlet prepared “hunter-style,” preferably with wild mushrooms and game meat like boar or venison. Pork or chicken may be easier to find and is just as tasty prepared using this method. Start preheating a large cast-iron skillet over medium high heat with your frying fat of choice, and heating the oven to low. In a bowl, combine the arrowroot and potato starch; in another bowl, beat the egg with the water. Season the cutlets on both sides with salt and pepper, and dredge each one thoroughly in the arrowroot mixture–use it all up, then mix up the almond flour and paprika in the same bowl. Next, dip the cutlets one by one in the egg wash, then coat with the almond flour mixture until well coated. When all the cutlets have been dipped in the coatings, fry them up in the hot grease in batches, about 2 minutes per side or until golden-brown. As they come out of the skillet, put them on a sheet tray in the oven to stay warm and crispy while you prepare the rest of the meal. Once all the meat has been cooked, use the same cast iron skillet with all the drippings to make the gravy: Saute the onion and garlic until soft and fragrant, then add the mushrooms and cook them down until slightly browned. Add some extra lard or butter if need be, as the mushrooms really tend to drink up that fat. Deglaze the skillet with wine, then add the broth and thyme, and allow to simmer until slightly reduced. Pour off about half a cup of the hot liquid into a measuring cup and blend in the potato starch, making sure not to leave any lumps; when it thickens up, pour this mixture back into the gravy over low heat and stir until it reaches a thickened consistency; stir in the sour cream and serve immediately over the warm schnitzels. Source: Adapted from The Domestic Man.